Gold was discovered on Nevada Gulch, a short tributary of Moore Creek in 1910 (Maddren, 1911) and the Discovery claim on Moore Creek was staked in 1911 (Mertie, 1936). Shallow deposits were worked by opencut scraper and hand methods in the first 20 years of operation. In 1913, some ground was being prepared for a dredge; however, a dredge never operated on Moore Creek. In 1927, a Northwest dragline, one of the first in southwest Alaska (Smith, 1931) was brought into the district for exploration, development, and mining. By the 1930s, mechanized placer mines equipped with draglines and bulldozers dominated activities in the district. The dragline stacked tailings in regular, linear tailing piles up to 6 meters high down the valley of Moore Creek. In the mid-1930s, the USSR&M company initiated a churn drill program in Moore Creek basin with the idea of developing ground for a large-scale dredging operation (Smith, 1937). Large scale mechanized mining was nearly continuous until Statehood and then intermittent through 1986. Small scale exploration and development activities continued through 2001. From 1911 to 1986, at least 53,990 ounces of gold and 12,520 ounces of silver have been produced from the Moore Creek Mine (Bundtzen and others, 1988; Miller, Bundtzen, and Gray, in press). About 1,383 ounces of gold and 64 ounces of silver have been produced from nearby Nevada Gulch, mainly from 1911 to 1929. Beginning in the early 1930s, Gus Uotila, Charlie Uotila, John Ogriz, and Elmer Keturi operated the first bulldozer-based placer mine and established Moore Creek Mining Company. 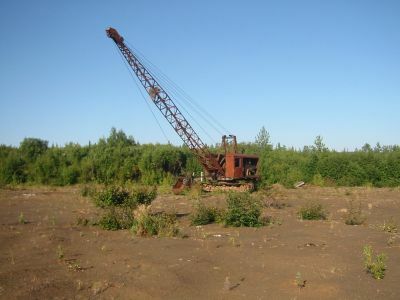 More than 70 percent of the total historic production occurred from the mid 1930s to about 1955, when a highly successful dragline/bulldozer plant operated by Elmer Keturi and Jules Stuver mined the deposit. Annual production ranged from 2,000 to 6,500 ounces of placer gold throughout the 1930s and the 1950s (unpublished U.S. Mint records). From 1933 to 1937, the Moore Creek Mining Company was the largest producer of gold in the Iditarod District (Smith, 1936, 1936, 1941 [B 926-A]). The best year of production was 1937 when 6,500 ounces of placer gold was produced. Moore Creek Mining Company also found abundant cinnabar during mine operations (Joesting, 1942). Work in the 1980s concentrated on recovering coarse nuggets from tailing piles. Early dragline operations did not have nugget collectors and coarse nuggets have been found in tailings in recent years. 1908 – Gold discovered on Moore Creek by A. A. “Tony” Zimmerman (O). 1910 – Good prospects reported on Moore Creek (P). 1912 – Most productive year. Several plants working on creek. (D) 30,000 sq. ft. bedrock cleaned produced 1933 ounces. 1913 – One claim with 12 men working. Ground shallow, all work by hand. 1914 – Same as above. Plus, Claim #5 above Discovery has two men working and Bench Association & Fraction has four men working. Sandstone and shale bedrock, creek claims have 10 feet of cobbles ranging from 6″ to 36″ in size. On benches 3 feet gravel with 2 feet clay and vegetation. Water from Willow Creek brought to bench, impounded, with head of 20 feet. Concentrates contain cinnabar, zircon, and little magnetite. 1924 – Continued operations on No. 6 Pup successful even though problems with new ditch. 1927 – A Northwest dragline, one of the first in southwest Alaska (Smith, 1931) was brought into the district for exploration, development, and mining. 1936 – Claim #5 most productive. Gold in base of gravel and top 1-1/2 feet of bedrock. Considerable quartz, gold 767 fine 225 silver. Largest producer in district. 1940? – Warner Stewart of Flat discovers and explores Broken Shovel prospect prior to World War II. 1950 – Moore Creek Mining Company of Fairbanks active. 1996 – Meta-aluminous, alkalic-calic boron enriched plutons of monzonitic composition; Late Cretaceous-early Tertiary age. Gold fineness 758-883, average 836, heavy minerals chromite, cinnabar, native silver, silver sulfosalts, highest silver/gold ratio of any district. Boron-enriched silver-copper-quartz veins cut a small monzonite pluton at the Broken Shovel prospect, about 70 km southwest of McGrath (Figs. 1, 2). The 4 square km pluton, which yielded a K-Ar biotite age of 68.3 Ma, intrudes the Upper Cretaceous Kuskokwim Group flysch. The chalcopyrite-arsenopyrite-quartz vein trends for 200 m in a northeast direction and features en echelon sheeted tourmaline veins nearly 30 m thick that extend along the hanging wall for the entire length of the deposit. Silver to gold ratios average 555:l; six analyses average 0.25 percent arsenic, 0.24 percent antimony, 0.07 percent lead, and 0.48 percent copper (Bundtzen et al., 1988). Homogenization temperatures of quartz fluid inclusions from the Broken Shovel deposit near Moore Creek, which is interpreted in this paper as a boron-enriched silver-tin polymetallic deposit type, range from 254Â°C to 380Â°C and average 297Â°C (Bundtzen et al., 1988). 2003 – Mine purchased by Moore Creek Mining LLC. Tailing pile pile produce many large nuggets and specimens in 2004. 2005 – “Pay-To-Mine” operation commences at Moore Creek. A 24.79 oz gold specimen is found by a visitor. 2006 – Full Metal Minerals begins hardrock exploration on the property. 2007 – “Spring” and “Troy” hardrock prospects discovered. Full Metal partners with Highbury Projects. 2009 – Pay-to-mine operations continue for the fifth summer, with a total of about 350 ounces of gold nuggets and specimens found over the five year period. 32.2 ounce gold nugget found by visitor. Moore Creek Mining LLC turns placer and pay-to-mine operations over to Moore Creek Pay-To-Mine LLC.